Vary the apparatus. Use counters, blocks, children etc. If you have established Numicon in the school, use that. When children are ready, extend their concrete experience to show the number as a visual image (just a posh name for a picture), which relates directly to the linked recording in Catch Up®. Use crosses or tally marks, for example, at first, but later show on a number track (as is on a board game) and then on a number line. A track is simpler for a child than a number line, but start your track at one not zero, otherwise ‘one’ will be on the second space which, initially, can be confusing for a struggler. Don’t swap back and forth from a number track to a number line until the child fully understands both. Don’t underestimate the mathematical power of children playing simple board games. A tip though - encourage them to push their counter the required spaces, without lifting it off the track. If they pick up their counter before counting on, it can all go very badly wrong! Finally, they must know how we write their Mathematics so someone else can understand: the symbolic representation. Hopefully, their number formation will now be more correct, if you used the tips in the previous Lynne’s logic! If you use the word ‘sum’, it must be an addition calculation (that is what sum means!). No take away, multiplication or division sums please!! Don’t just teach addition as ‘altogether’, e.g. 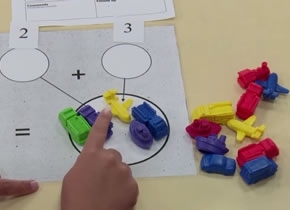 ‘David has 3 sweets and Pat has 2 sweets, how many do they have altogether?’ Children need to understand addition as an ‘increase’ and as ‘more than.’ An increase is relatively easy. ‘If David has 3 sweets and he gets 2 more, how many does he have now?’ Both of the two problems given would look identical as a number line calculation and as a number sentence. Contrast this to a ‘more than’ calculation. ‘David has 6 sweets but Pat has 2 more than David. How many does Pat have?’ Children will have a better understanding if this is shown with apparatus for David, and apparatus for Pat, showing the matching 6 plus 2 more. (They will also then see there are 14 sweets in all.) Show this in the linked recording. If using them, there should be two number lines in the linked recording, one for David and one for Pat. A valuable exercise is to ask your children to think of their own word problem to match the written calculation or the concrete representation. If your pupils can create word problems, they will become more confident solving them. You will need to give the children models at first, particularly to extend their understanding of ‘increase’ and ‘more than’ calculations. David has 6 sweets and Pat has 2 more than David, how many sweets does Pat have? David has 5 sweets and Pat has 4 more than David, how many sweets does Pat have? David has 5cm of ribbon and Pat has 4cm more than David, how much ribbon does Pat have? Baby David weighs 6kg but baby Pat weighs 2kg more than David. How much does Pat weigh? I hope this helps your children to become more confident vipers, sorry adders, in a range of situations. Next time – subtraction!